A Kruger Tour for those on a budget. Explore and experience the Kruger and surrounds and enjoy fantastic game viewing - great wildlife photographic opportunities. Accommodation is in permanent tents. All activities and game drives included. Day 1: Early departure from Johannesburg and the airport, and we head for the Kruger Park, South Africa’s most famous game reserve. The Kruger Park is located in the subtropical savannahs’ of the low veld and provides ideal conditions for wildlife. The Kruger National Park is surrounded by private game reserves and many of them have removed fences allowing the animals to roam between the Kruger and private reserves. This whole area is known as the “Greater Kruger” and is ideal for safaris. Our adventure begins in the private reserve of Balule, where we enjoy our first open vehicle game drive. Our drive continues into the evening and we have an opportunity to view nocturnal animals using spotlights. A traditional braai (barbeque) is enjoyed in a boma deep in the African bush. The night is spent at a comfortable lodge. Day 2: The day begins with an early morning game drive deep into the African bush. Here do a 3 -4 hour bush walk and have an opportunity to learn about the bush, including spoor/tracks and smaller animals. 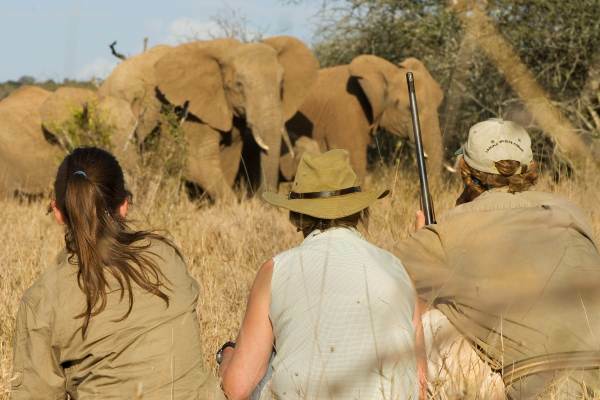 Enjoy the thrill of stalking large animals on foot including the Big 5. The bush walk is led by an armed qualified ranger who is knowledgeable about the wildlife, birds and plants. We return to the lodge for brunch and a well-deserved rest. 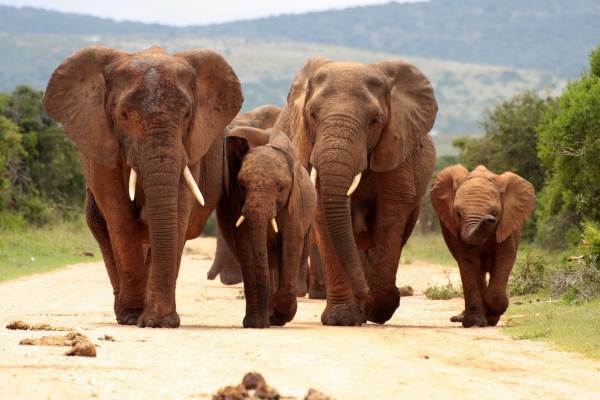 In the afternoon we head out on an exciting game drive. In the late afternoon / early evening we make our way to our camp where we have dinner and take in the night sounds. The evening is spent in permanent tents which are located on a nature conservancy. The tents are comfortable and fully equipped – and are a popular option for clients on a budget. The camp is located on the Klasrie River in the Motlala Game Reserve which is home to a range of animals including black and white rhino, buffalo, giraffe and numerous antelope species. Day 3: After an early morning breakfast we board our special game viewing vehicle. We enter the famous Kruger National Park through Orpen Gate, located in the central area of the Kruger. This part of the reserve is ideal for wildlife viewing and has the highest concentration of animals in the Kruger Park. One can expect to see large herds of elephants, zebras, antelope as well as giraffes, rhinos, and predators including lions, cheetahs and leopards and enjoy amazing photographic opportunities. We take a welcome break and lunch at one of the rest camps, before continuing our game drive searching for the Big 5. After a full day of wildlife viewing we return to the camp for a welcome rest. Day 4: Our final day begins with a nature walk where we have a chance to get more detail about bush. We are accompanied by an armed ranger as there is a good chance of encountering various animals. After breakfast we begin our journey back to Johannesburg. En route we stop at the Blyde River Canyon to take in the magnificent view of the “Three Rondawels”. Our tour ends in the late afternoon.